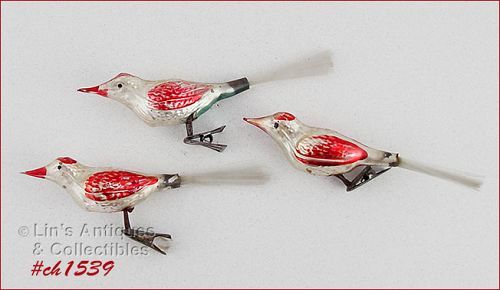 What a treasure – this is a vintage glass ornament shaped like a closed umbrella! It’s an ice size ornament at 5 5/8” long, the glass is the old, very thin glass, and it’s in very good vintage condition. The handle has some paint loss that was probably caused by holding it by the handle. The metal cap is marked West Germany. Super! 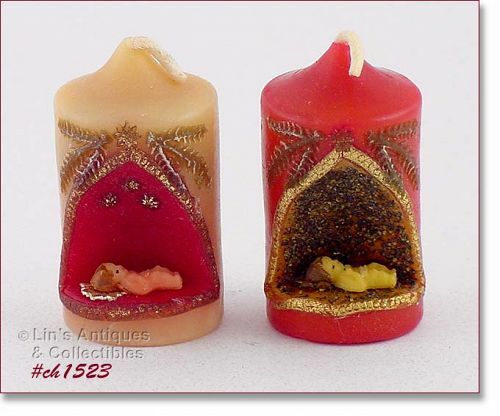 This listing has two neat candles – one is white, the other is red, and both have small wax baby Jesus on front! Candles measure 2 ¾” tall and are in very good condition. Neither candle has the original cardboard base/labels but I believe these to be Gurley candles. 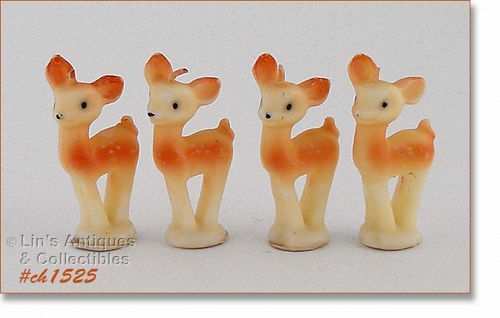 I’ve grouped these 4 Tavern young rudolph candles into one listing! They measure 3” tall (at tallest) and all have the original Tavern Company cardboard bases/labels. Candles are in super condition! 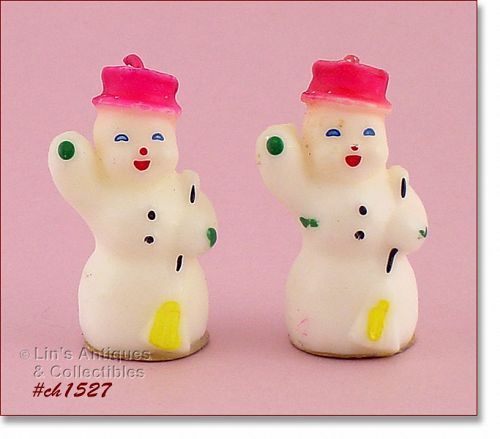 This listing has two Gurley little snowman candles! They measure 3” tall, are in super condition, and both have the original Gurley cardboard bases/labels. 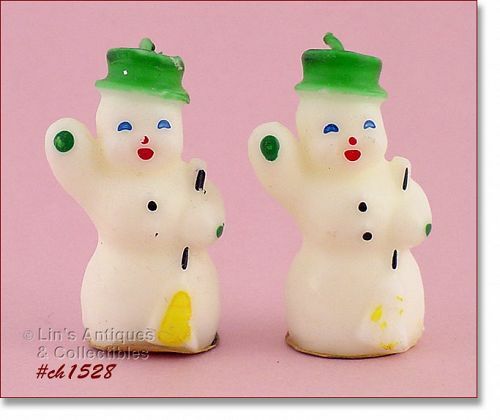 This listing has two Gurley small snowman candles with green hats! Candles measure 3” tall (at tallest), are in super condition, and both have the original cardboard bases/labels. 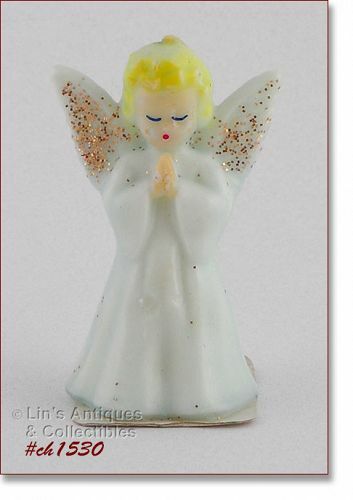 This is a pretty and somewhat unusual praying angel candle – she’s a pale blue color! Candle measures 4 ½” tall (at tallest) and is in very good condition (has an indentation on her skirt). She’s on an unmarked cardboard base but her shape indicates she is probably a Gurley production. 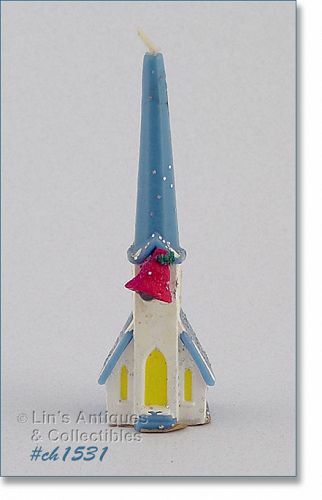 This listing has a super condition Gurley church shaped candle! It measures 4 ¾” tall (at tallest) and has the original Gurley cardboard base/label. This listing has two vintage Gurley Christmas tree shaped candles! They’re green with glitter, measure 3 1/8” tall (at tallest), are in super condition, and both have the original Gurley cardboard bases/labels. 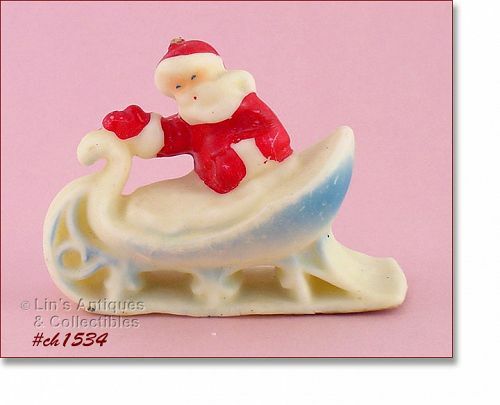 This is a rather unusual Tavern Company candle – Santa in a sleigh! Candle measures 4 ½” long (at longest), 4” tall (at tallest), and 2 ½” wide (at widest). It is in very good condition and has the original Tavern Candle cardboard base/label. 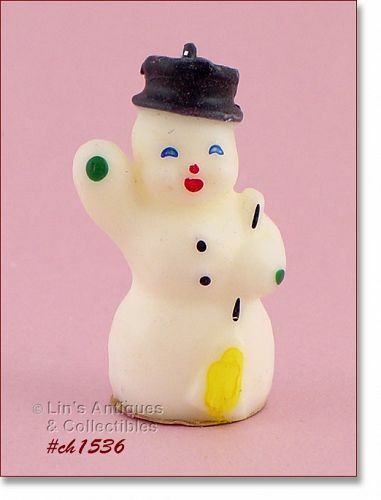 This listing has a cute vintage Gurley candle shaped like a snowman! He wears a black top hat, measures 3” tall, is in super condition, and has the original Gurley cardboard base/label. 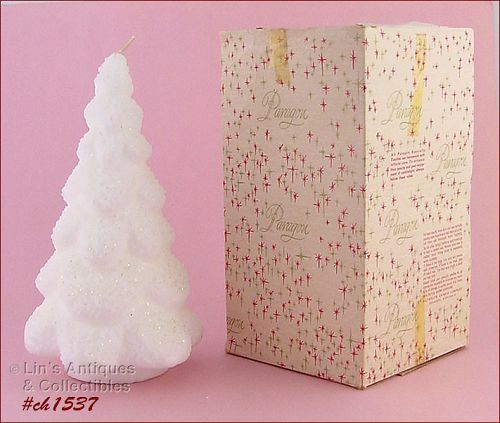 This listing has a white Christmas tree shaped candle by Paragon Victrylite of Oshkosh, Wis! Candle measures 9” tall, is in super condition, has the original Victrylite cardboard base/label, and is in the original box. Beautiful candle, nice and clean, looks new! 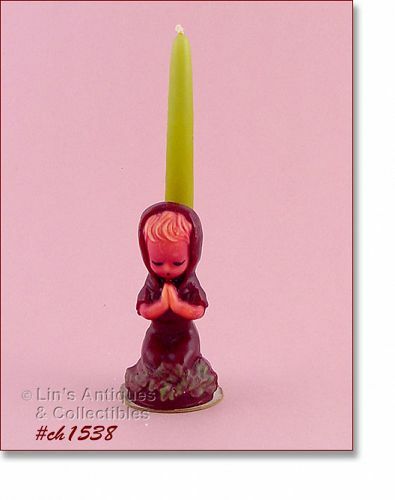 This is a very pretty candle of a praying girl and it's in excellent condition! She measures 4 ½” tall and the candle portion is 8” tall. 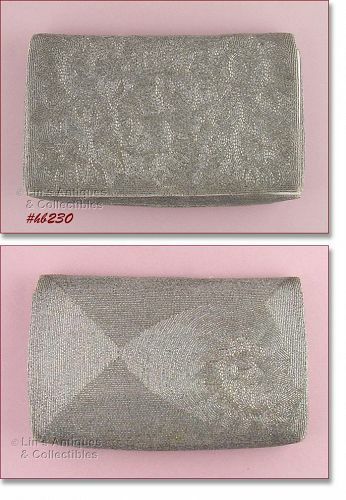 Candle has the original Norcross Heirloom cardboard label/base, made by W. & F. Mfg. Co. of Buffalo, N.Y., and the original price of $1.00. 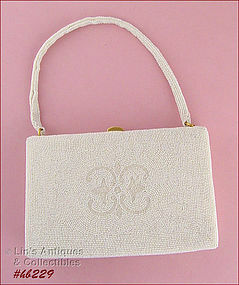 The Gurley Novelty Company began as the W & F Manufacturing Company. W & F Manufacturing Company was created in the late 1920s by Franklin Gurley. 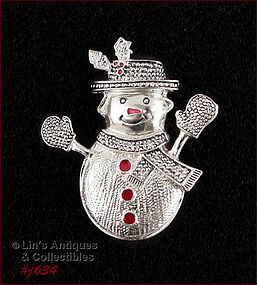 This is a really cute little pin and it’s somewhat unusual – it’s a snow lady! She measures 2 1/8” tall (at tallest) and 2” wide (at widest, mitten to mitten). 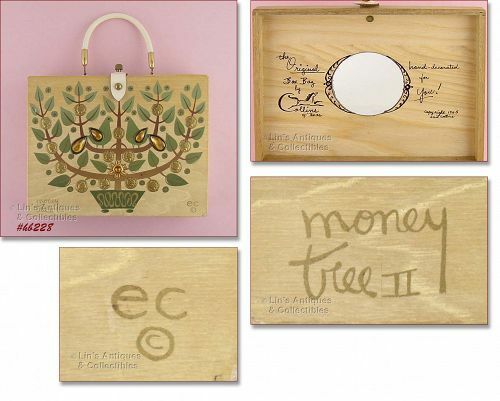 Excellent condition – a neat stocking stuffer! 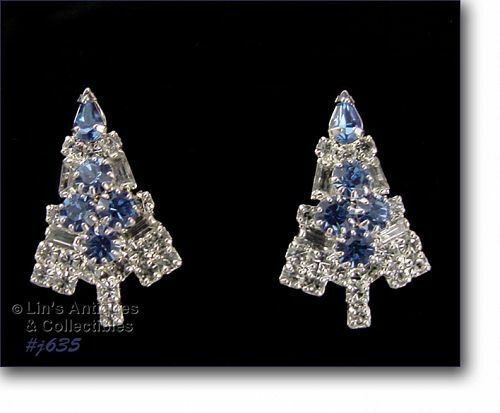 Beautiful Eisenberg Ice Christmas tree shaped earrings! These measure 1 1/16” long (at longest), 5/8” wide (at widest), and backs are marked Eisenberg Ice. The “tree” is sparkly clear rhinestones “decorated” with blue rhinestones as ornaments with a blue rhinestone tree “topper”. These are silver-tone metal and all rhinestones are prong set. Earrings are on a plain black hang card. These are new old stock; never worn.